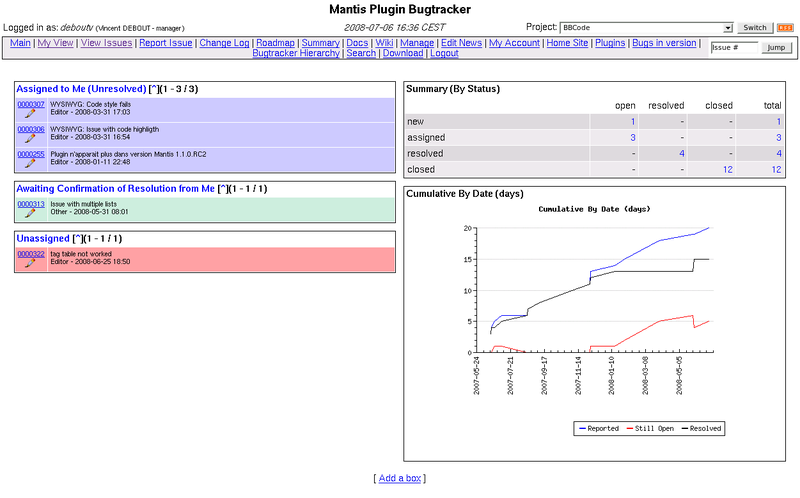 This plugin allows users to build their own My View page with bug lists, stats, graphs and RSS feeds. Displays graphs (of the summary pages). Displays statistics (of the summary pages). Displays bug boxes (of the initial My View page). Displays graphs from the plugin Graph. Build your own filter to display a bug list. Order the bugs by a selectable criteria (available fields: category, date submitted, ETA, fixed in version, handler, ID, last update, OS, platform, priority, project, projection, reporter, reproducibility, resolution, severity, status, summary, target version and version; order: ascending and descending). Bugs displayed per box customizable. Plugin supported on Firefox, Internet Explorer and Opera.